This happened to me recently when I decided to share a story with our audience at KidsTown Live!. The story was one that I knew very well and had taught several times over my time in children's ministry. The story was the one about Jesus feeding the 5,000. Up to this point, I had always just taught the story as an informational type story showing the kids another miracle of Jesus. This time was different though. 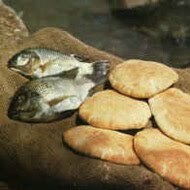 I saw in the story the disciples who had approached Jesus asking Him what they should do about all these people who were getting hungry. I imagined what kind of reaction they probably had when Jesus turned to them and said, "You feed them." As the disciples processed this situation in shock, their response was basically, "We don't have that kind of money! And even if we did, the local town isn't going to have enough food to feed this size crowd!" Jesus then replies that the disciples should go out into the crowd and see if anyone has brought any food with them. As the disciples do this, they find just one boy who has just five loaves of bread and two fish. I can see the disciples now walking back to Jesus with just this one small basket of food gotten from a child. "I can't believe we are even bringing this to Jesus! This offering is pathetic! There is no way this is going to do any good at all! Look at how many people there are- how great the need and how small what we have to give!" I bet guilt and embarrassment set in on the disciples as they returned to Jesus and sheepishly offered Him their sad little basket of food. "I'm sorry Jesus, this is all we have" I can imagine them saying…Was this offering by the disciples enough for Jesus? Yes it was. It certainly didn't look that way though. And this is exactly the way Jesus wanted it. "This is enough." I can imagine Him telling the disciples. "What?! Are you kidding?" But it's true. This was a moment for His name to be glorified. For others to see that there was no way man in his own efforts could accomplish what was about to happen but with Jesus' help there would be a solution…that He would take what seemed like not enough and it would become enough. On our own, we are not designed to be the answers to what so many people are searching for. Our efforts in and of themselves are not enough. But Christ will take our humble offerings and it will become enough. In an area of my ministry, I was being overwhelmed by the difficulties and challenges of some of my helpers in their real lives. I had begun to get below the "church image" of a couple people and it was very heartbreaking to learn what my beloved helpers were struggling with. I wanted so badly to solve their problems, take away their pain, give them the answers they were searching for…but God began to remind me that I could not alone be the answer to their needs. But that if I humbly offered what I did have, that HE would fill in the rest and become the answer. I really believe that He takes great joy in that moment when His child comes to the realization that they cannot handle all of life themselves… that they've fallen short of expectations…they've failed in some capacity …that they need help…His help…and they humbly hold out to Him what little they have and who they are and allow their loving Savior to excitedly reach out His nail pierced hands and hold His hurting or exhausted child that is now ready to let Him be what is needed. I believe that in those moments of shame when we cry out to Him and admit that we just aren't enough…not working enough, not giving enough, not listening, loving, doing right, or whatever, that He takes what we have done and smiles to us in love, though we may not be able to look Him in the face to see, and says, "It is enough my child."